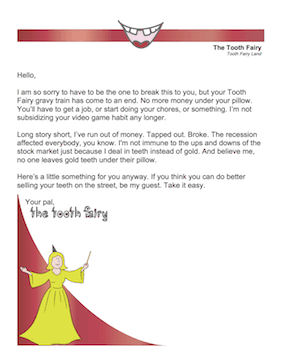 Older kids will love receiving this sarcastic letter from the Tooth Fairy, which explains why the child didn't receive any money for his/her tooth. I am so sorry to have to be the one to break this to you, but your Tooth Fairy gravy train has come to an end. No more money under your pillow. You'll have to get a job, or start doing your chores, or something. I'm not subsidizing your video game habit any longer. Long story short, I've run out of money. Tapped out. Broke. The recession affected everybody, you know. I'm not immune to the ups and downs of the stock market just because I deal in teeth instead of gold. And believe me, no one leaves gold teeth under their pillow. Here's a little something for you anyway. If you think you can do better selling your teeth on the street, be my guest. Take it easy.